On Day 3 of the IMSA Elite Mind Games, China and Taipei met in men’s team play. China’s number 1, Ke Jie, had no problem with Wang Yuan-Jyun; but the 2016 Ing Cup winner Tang Weixing lost to veteran Chen Shih-Yuan to make the team score 1-1. This result leaves the suspense of championship to the last round tomorrow - the winner between Taipei and Korea will be the champion. But if they are tied, the three teams will have the same team scores and a complicated tie-breaker will be used to determine the winner. In the other matches, Europe tied North America when Ilya Shikshin defeated Mingjiu Jiang while the young Canadian Ziyang Hu won a complicated fighting game against Mateusz Surma. Korea defeated Japan 2-0. On the women’s side, China and Korea met for the top match of the day. China’s Yu Zhiying played a beautiful territory game to win over Choi Jeong. In the second game, which was also the latest to finish for the day, Korea’s Oh Yu-Jin won against Lu Minquan to tie the team score at 1-1. Japan beat Europe and Taipei beat North America, both at 2-0. In tomorrow’s fourth and last round, on the men’s side, China will play vs Europe, Taipei vs Korea, and Japan vs North America; on the women’s side, North America will play vs Korea, Europe vs Taipei, and China vs Japan. 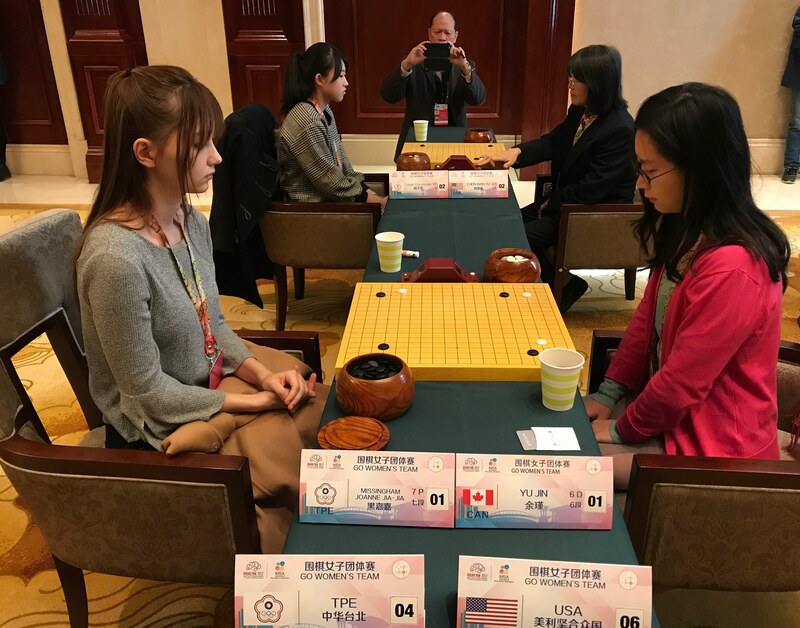 - Thomas Hsiang; photo shows the matches between Taipei and North America. In the front are Joanne Missingham and Sarah Yu; in the back are Yang Tzu-Hsuan and Wan Chen.